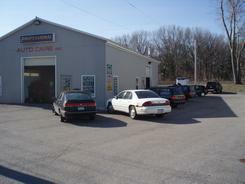 In 1991, the idea first hit me to open my auto repair shop in Rochester, NY. I remember thinking how incredible it was going be having my own business . The idea seemed bigger than life itself. After all, instead of repairing cars at someone else's auto repair shop, I'd have hundreds, or even thousands of cars to repair and be responsible for. I had really no idea what I was getting myself into. Sure I was a great mechanic, and had fixed thousands of vehicles successfully, but I had no experience running an auto repair shop, or managing other mechanics. Looking back I laugh, because the last 15 years have been an exciting and educational journey. Despite the challenges, I was determined to create a new type of auto repair shop, something totally unique and different from the places I'd worked before. I'm pleased to say that my dream has been realized. Our shop is truly like no other. As I think about where my auto repair shop is today, how it got here and where it's going. I'm overcome with gratitude. I know that you cast one giant vote of confidence when you decide to place your vehicle in our hands. I'm truly thankful for every client that has made that choice and allowed us to properly service and repair their vehicles. Helping to keep them and their families safe and trouble free is our goal, and we work constantly to improve at doing that more quickly and more cost effectively. So today, thanks to you, Professional Auto Care Inc. is truly a great company! I think of each of you as a friend and special client.